Harry was the last Croft Lord of the Manor. 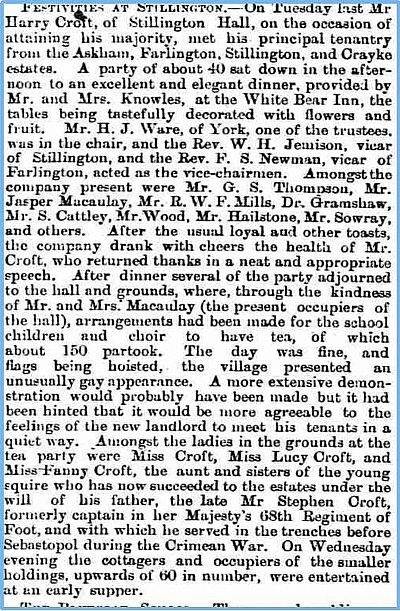 He was born at Fulford, son of Stephen Croft (1827 - 1871) and Fanny Prior (1830 - 1875). His father never expected to inherit the Manor however his elder brother, Harry, was drowned when the steamship Rip Van Winkle foundered in a hurricane whilst anchored off Balaclava on 15th November 1854. His father died aged only 43 leaving a will stating that Harry would inherit aged 21 with his mother and trustees administering the estate in the intervening period. Unfortunately Fanny died four years later. Stillington Hall was let by the trustees to Jaspar MaCaulay, who had made his fortune running flour mills in Belfast, whilst Harry and his younger siblings Lucy, Fanny and Stephen were sent to live with their aunt, Elizabeth Catherine Croft, in York. In 1878 Harry inherited the Manor. Unfortunately Harry also inherited the many problems that the Croft estates were suffering. Over the years the Crofts had become more and more dependant on the renting of farms for an income. Harry's grandfather, Colonel Harry, had moved away from farming himself in the late 1840s. However agriculture was in a steep decline due to the importation of cheap wheat and beef from Canada and lamb from Australia and New Zealand. Many of the estate farms, that had once brought in a good living, had to be let out on more favourable terms, which meant a decreased income. Even though Harry was unmarried he had three younger siblings, an aunt and his grandmother to support, who all were entitled to money from the estate under the terms of various wills. Strapped for money Harry relet Stillington Hall for a short time and then made the decision to put it up for sale, along with houses and land in Stillington, Farlington and Askham Bryan. 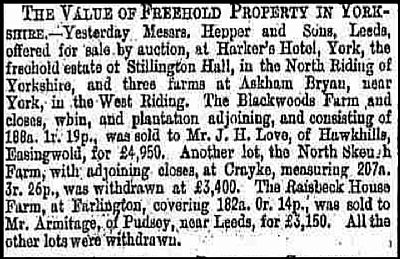 Some of the property put up for auction was successfully sold as this article from The Leeds Mercury dated 22nd June 1888 discloses. 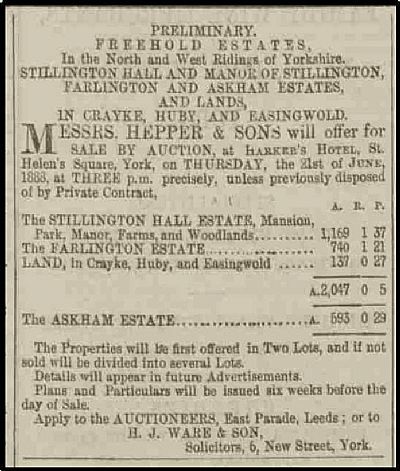 Finally in 1894 Harry got his wish, Stillington Hall was sold. A year later, 370 years from the date his ancestor Sir Christopher Croft acquired it for his only son Thomas, he sold his title as Lord of the Manor of Stillington. He settled in Devon, his mother's home county, with his wife Louisa whom he married in 1892 and settled to a quiet country life. In 1926 he came home for the last time to be buried with his ancestors.